Sulaiman H. Sulaiman is an accomplished Chief Information Officer and a leader with over 15 years of experience in creating and implementing information technology strategies, structuring and building effective teams to support today’s fast changing healthcare environment. He is an entrepreneur, innovative and passionate leader, continually challenging the status quo, developing and driving disruptive solutions to improve quality, efficiency and the patient- provider-consumer experience. 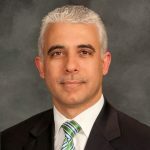 Sulaiman most recently served as Senior VP and Chief Information Officer at Mission Health System (Ranked one of the nation’s “Top 15 Health Systems” by Truven Health Analytics), where he led a redesign and rebuild of the IT Division to incorporate IT into the highest strategic levels of the organization. He introduced and led the “One Patient, One Chart” vision to integrate the health system into a single patient and provider platform. Implemented a robust analytics, cyber-security and project management programs to support better quality and more efficient care across the system. Sulaiman’s prior position was Chief Information Officer with Cleveland Clinic International services leading a complete revamp and technology transformation at Skeikh Kalifa Medical City in Abu Dhabi, UAE. He previously held several leadership positions in information technology within the Cleveland Clinic in the United States. Sulaiman earned a Bachelor of Science in Mechanical Engineering degree at Cleveland State University. He holds a Project Management Professional Certification (PMP and ITCPM). He is a member of the following organizations: Global Healthcare Advisory Board, Global Healthcare Innovation Council (Cisco), Customer Experience Board of Advisors (Cisco), Philips Healthcare Connected Sensing Board Member (Philips Helathcare), North Carolina HIMSS Board of Directors, and a member of the College of Healthcare Information Management Executives (CHIME). Formerly served: Cerner Client Care Council – Cerner Corporation (2009-2015), HIMSS Middle East CIO planning committee (2010-12).